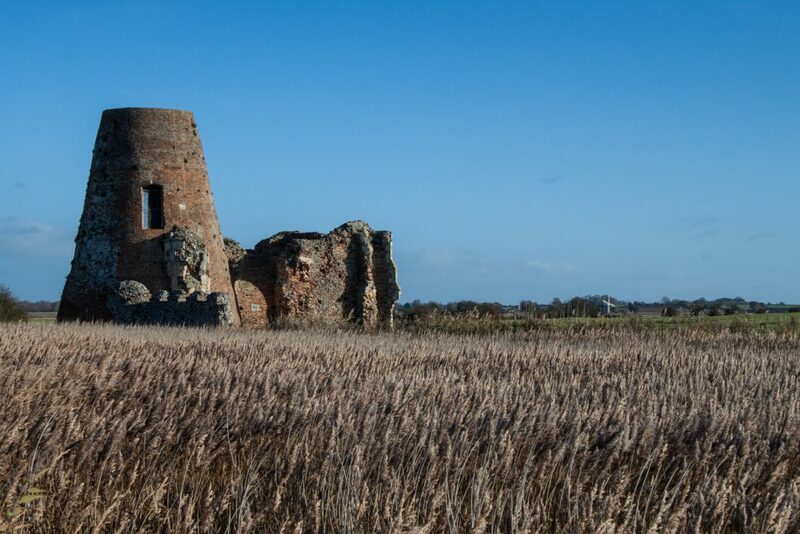 Welcome to Broads Tours’ Nature Blog, where we keep you in touch with what’s happening on Britain’s magical waterland – the Norfolk Broads. 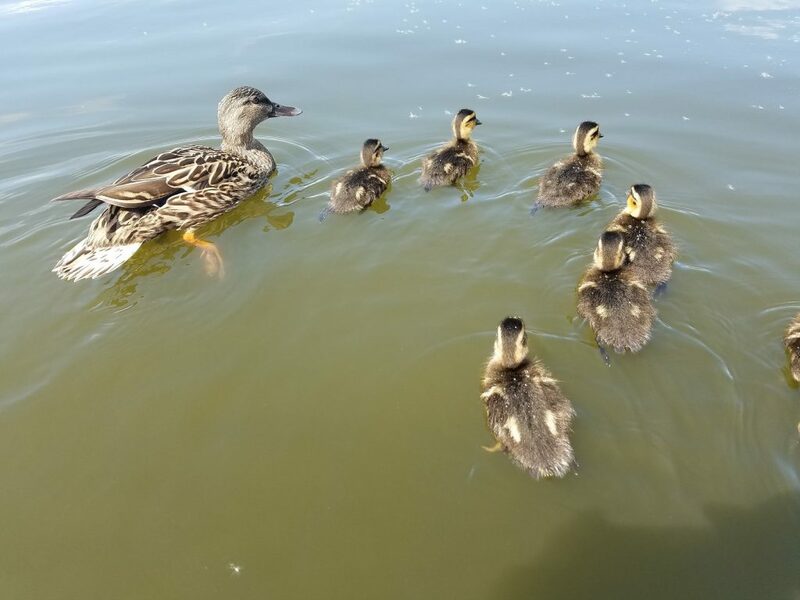 All of our trip boat skippers have the privilege of being out on the river Bure – between Wroxham and Horning – every day and seeing a wonderful tapestry of nature unfold through the seasons. 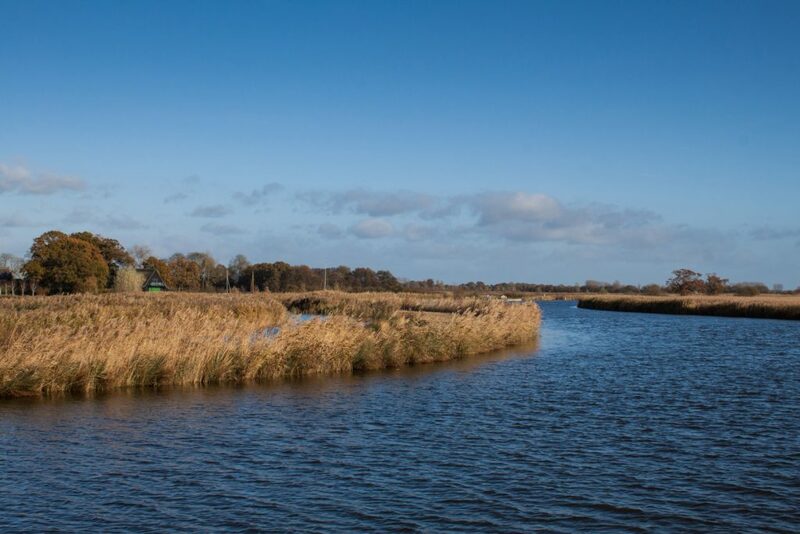 Whether you have been on a trip with us before, are thinking about visiting the Broads or just love nature, don’t miss the Broads Tours Nature Blog. They’ll keep you in touch with everything from nesting swans to some of our rarer species like Kingfishers, Marsh Harriers and Otters. If you only visit the Broads once a year this is the time to come. 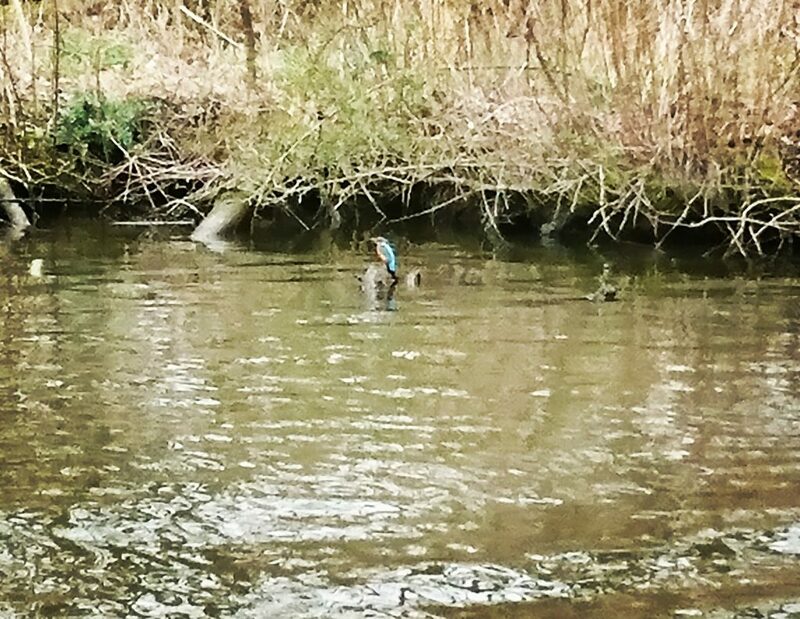 The waterways are full of birdlife busily rearing their adorable young in the sunshine. 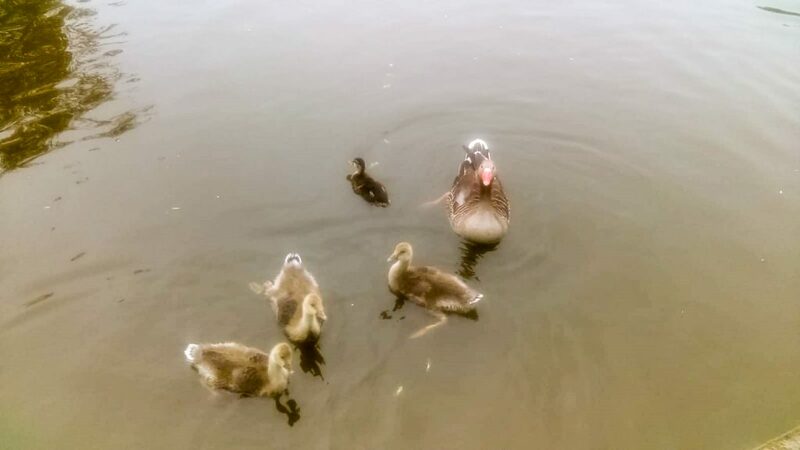 There are two families of adorable little cygnets delighting boaters alongside scores of ducklings and families of greylag, Canada and Egyptian geese goslings in Wroxham village. 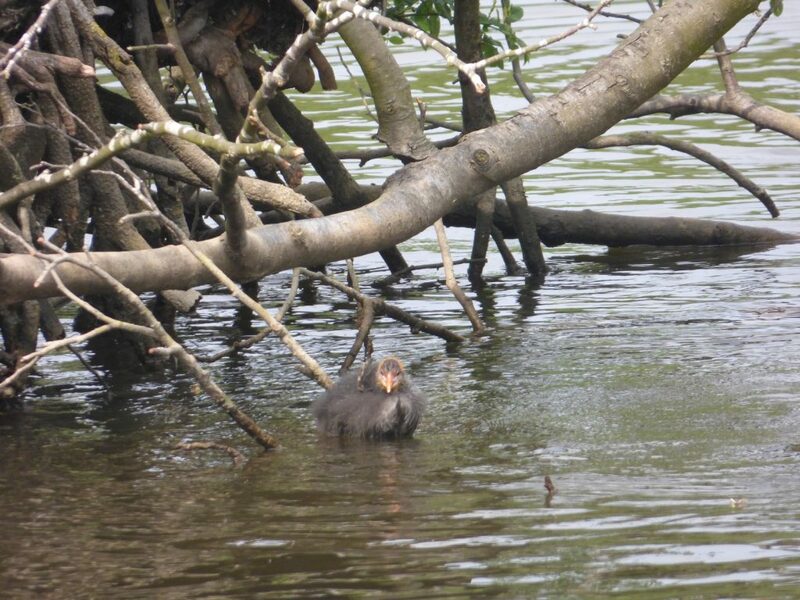 Perhaps our favourite place to spot young birds at the moment is Salhouse Broad. 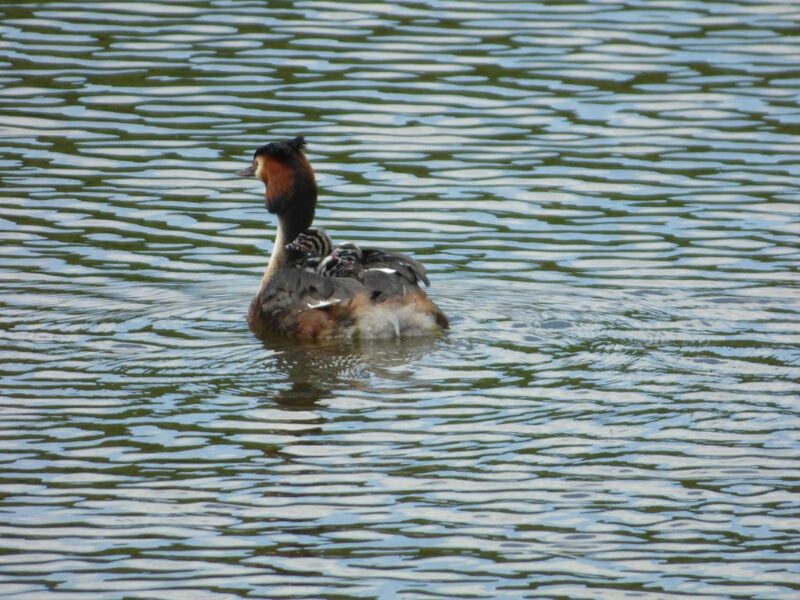 There are at least three families of great crested grebes carrying their adorable little ‘greblets’, which have black and white stripy faces, around on their backs. Other than looking super cute this protects their young from predators such as pike grabbing them in the water. 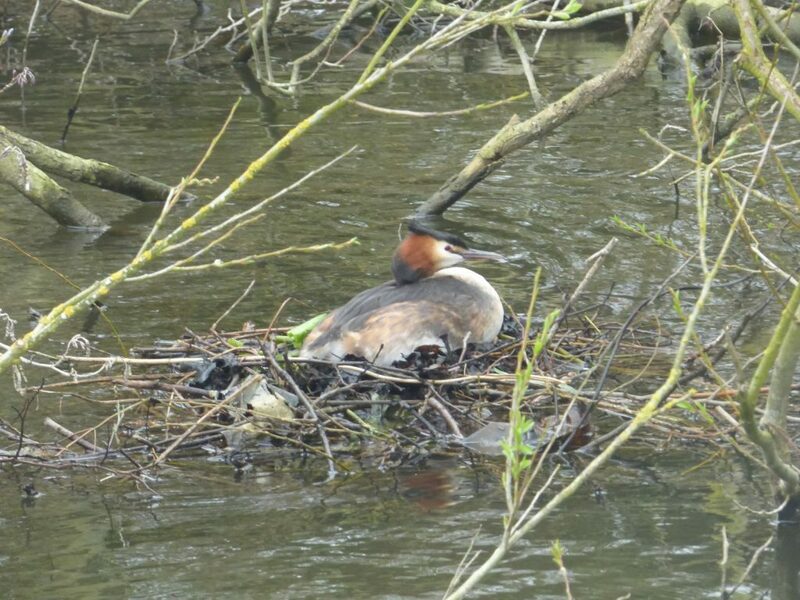 Two more great crested grebes are still incubating their eggs on floating rafts near the downstream entrance to the Broad, so we are eagerly awaiting more new arrivals! The reason that these birds are still nesting is that they had their initial nests destroyed. Undeterred they built another floating raft for their eggs and things are going well this time! 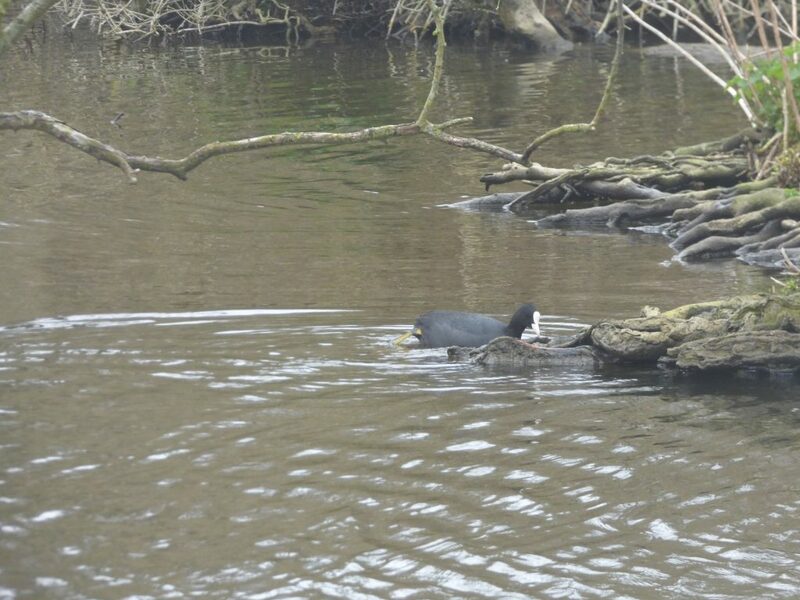 Another bird that builds floating nests is the coot and we are enjoying spotting their cootlings with fluffy bodies and brightly coloured beaks. Better still we have been enjoying regular kingfisher sightings in the area, not only as an electric blue flash as the birds fly fast and low over the water, but also perching on branches where passengers can get a good look at them. 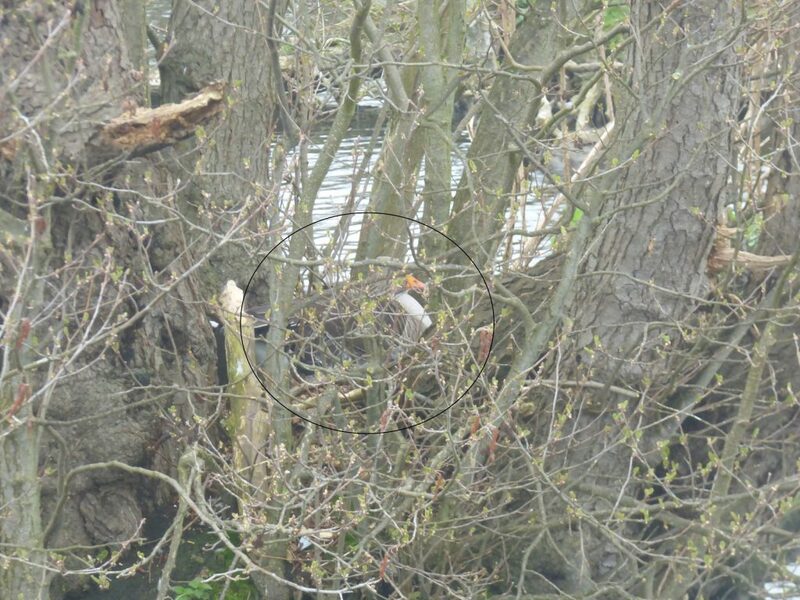 On several occasions there have been two kingfishers perching together on a branch and diving into the water to catch fish. Passengers are loving spotting otters on a regular basis and we have had some amazing encounters with them recently. Skipper Tom and his passengers were captivated by watching an otter carrying a huge pike in its mouth recently “the pike was almost as big as the otter!” he said. But perhaps the biggest surprise came when a very large dog otter slid out of the water and stood behind crew member Donna, while over 100 people were boarding the Queen of the Broads. 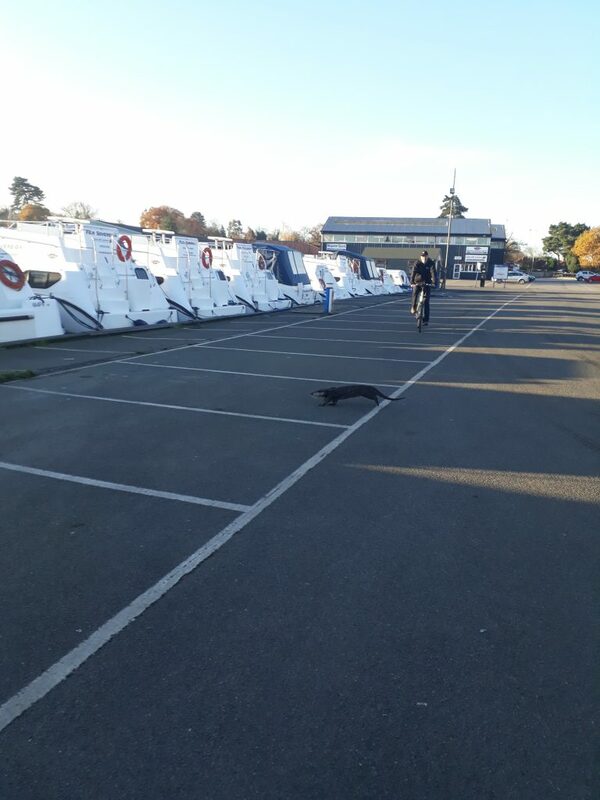 Skipper Oli said: “I looked up the pontoon where Donna was boarding customers and was amazed to see a huge otter stood right behind her. 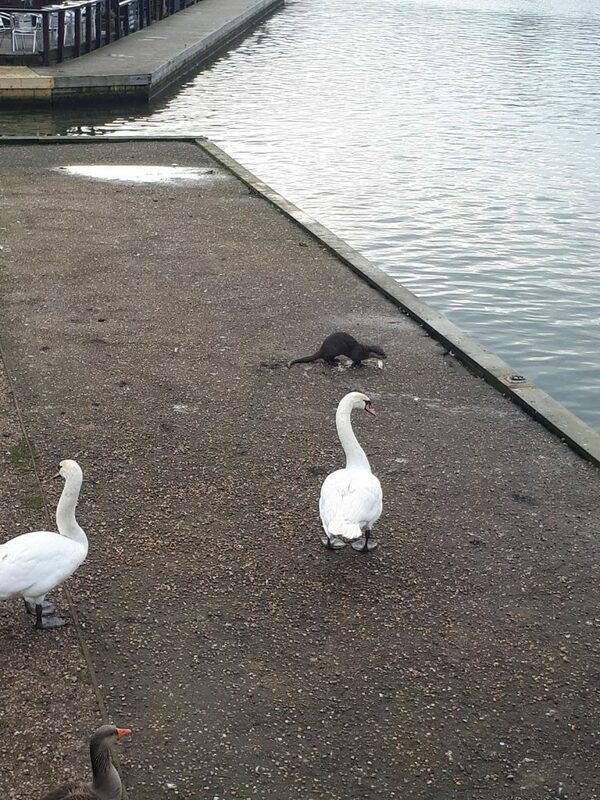 Donna was completely unaware of the otter, like the classic scene from a pantomime and when I shouted ‘its behind you’ she jumped out of skin!”. It really shows how confident otters are becoming even with lots of people about. Another welcome visitor to the Broads is common terns, who have been migrating in from Africa for the last few weeks. 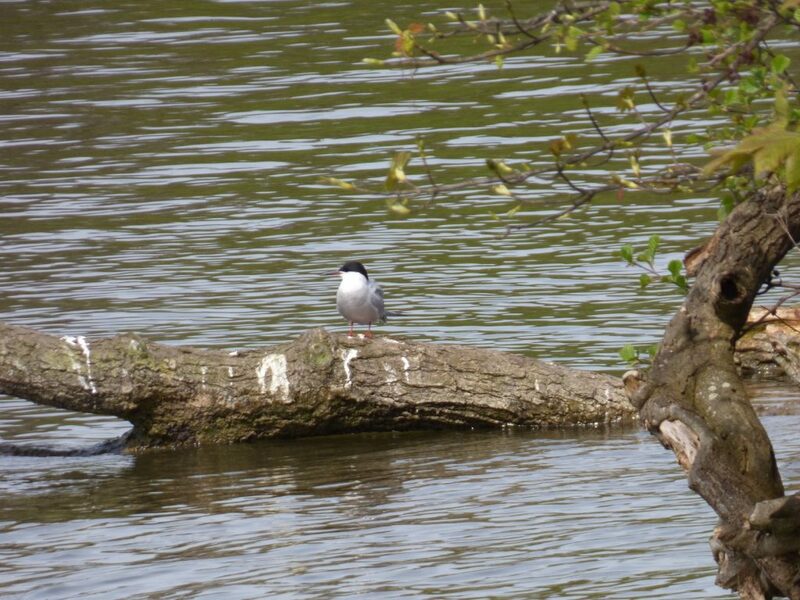 More than 20 pairs of the terns are laying their eggs on a special floating platform filled with sand on Hoveton Great Broad. 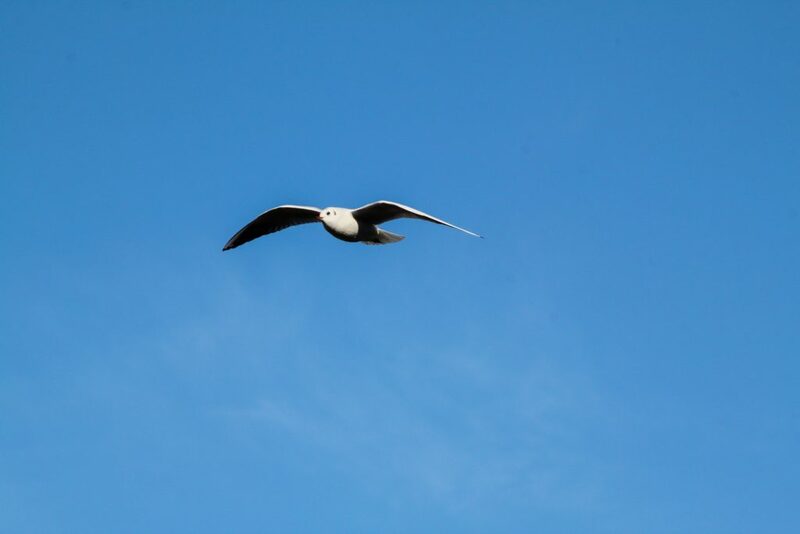 We are loving spotting the birds fishing on nearby Salhouse Broad where they perform amazing aerial acrobatics before dive bombing into the water to catch their lunch. 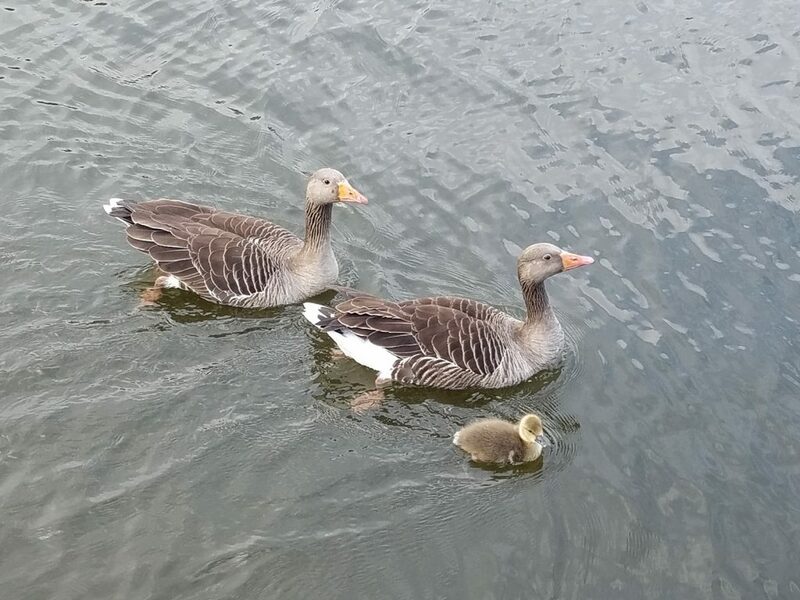 Finally, we will leave you with this rather amusing Broadland picture of duckling being raised as part of a greylag goose family at Irstead Staithe (near Barton Broad). It may have felt like winter until recently but this hasn’t deterred the arrival of the swallows and wonderful courtship and nesting rituals from a variety of birds. With the weather due to really hot up this week, feeling like it has skipped straight from winter to summer, it’s the perfect time to head out onto the water and see the wildlife for yourself. 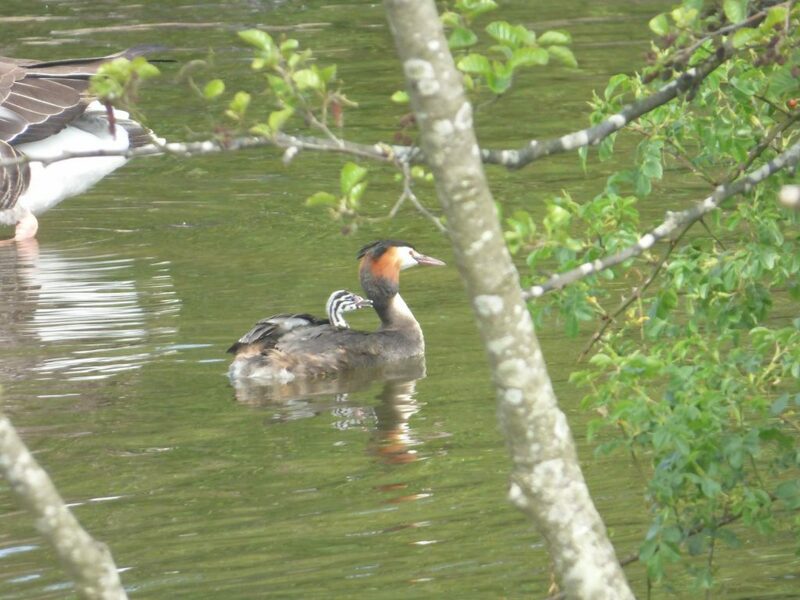 A real highlight is watching at least four pairs of great crested grebes nesting on Salhouse Broad. The birds, which are related to the penguin, have their feet on the back of their bodies which makes them excellent divers but useless on the land. 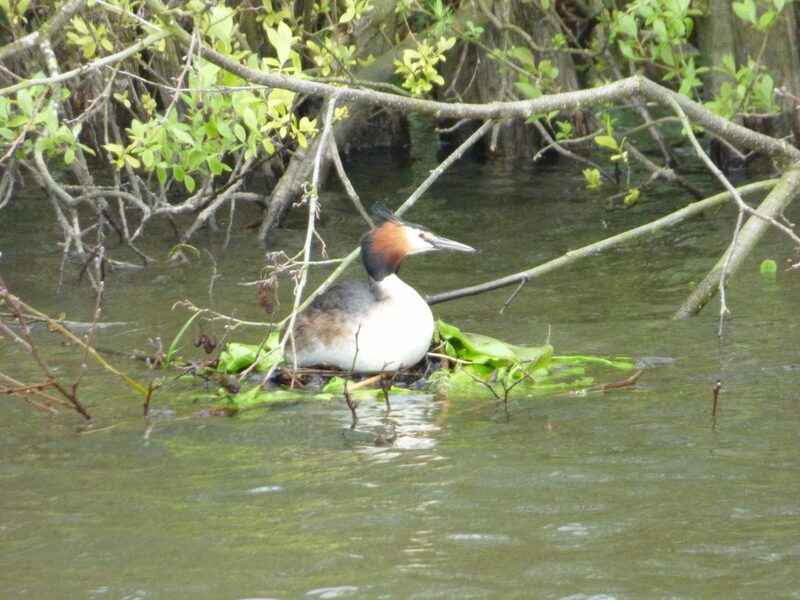 As a result, great crested grebes build floating nests to lay their eggs on. And passengers are loving watching the females sitting on these rafts while the males busily gather items to add to the nest. 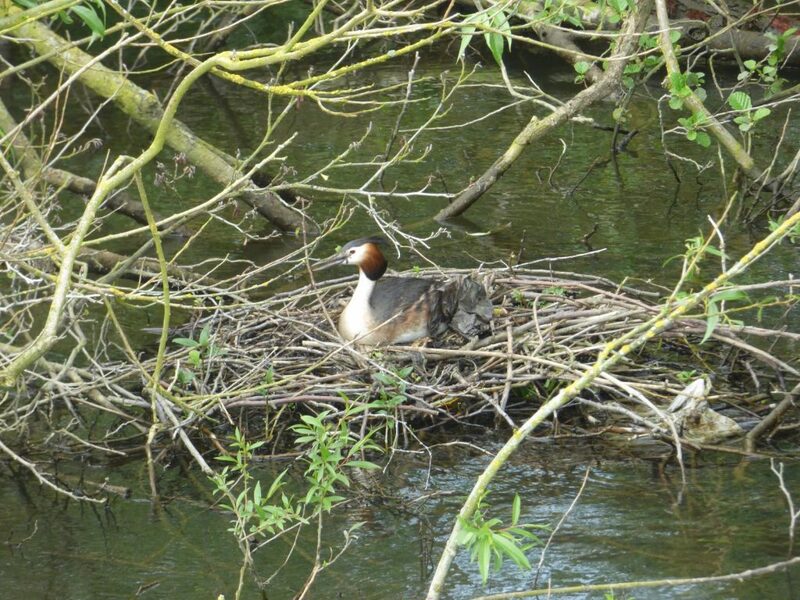 Great crested grebes often start building a nest and then abandon it to build another one in a preferred location. 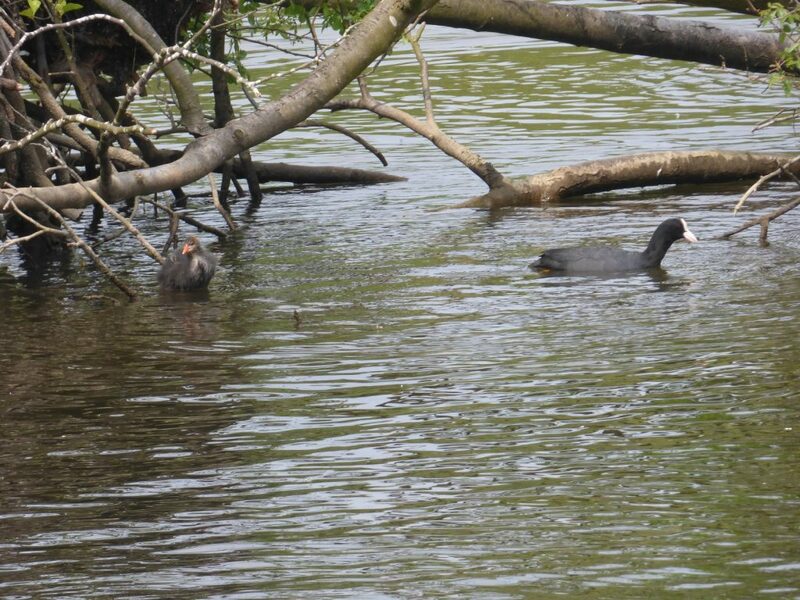 A pair of coots are making good use of this opportunity by starting to nest in one of these abandoned rafts. 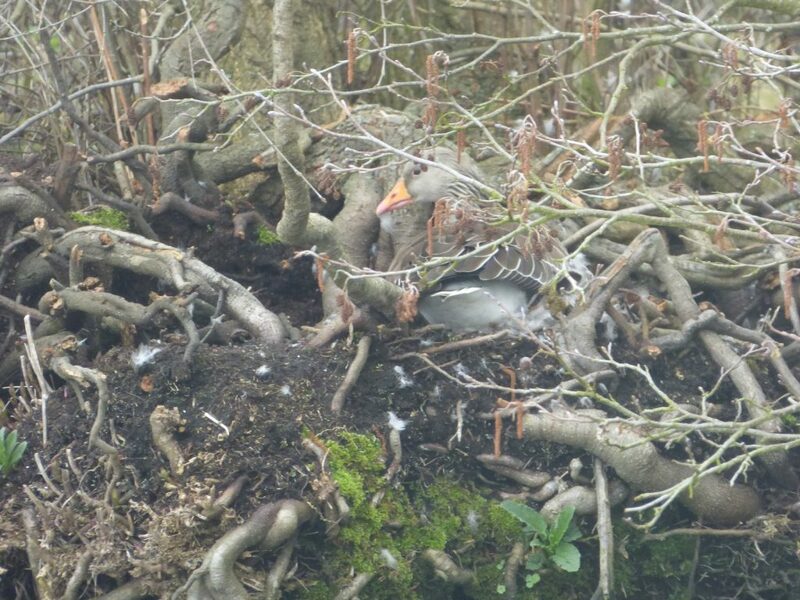 Canada and Greylag geese are also nesting on Salhouse broad at the base of tree trunks. The greylags are particularly well camouflaged – can you spot them in the pictures below? 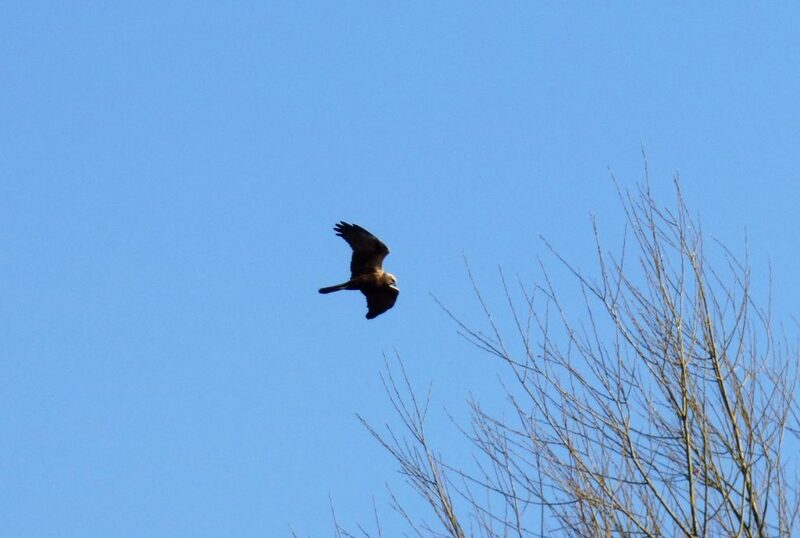 Another fantastic site has been lots of marsh harriers gliding over the reed beds in Horning Reach. 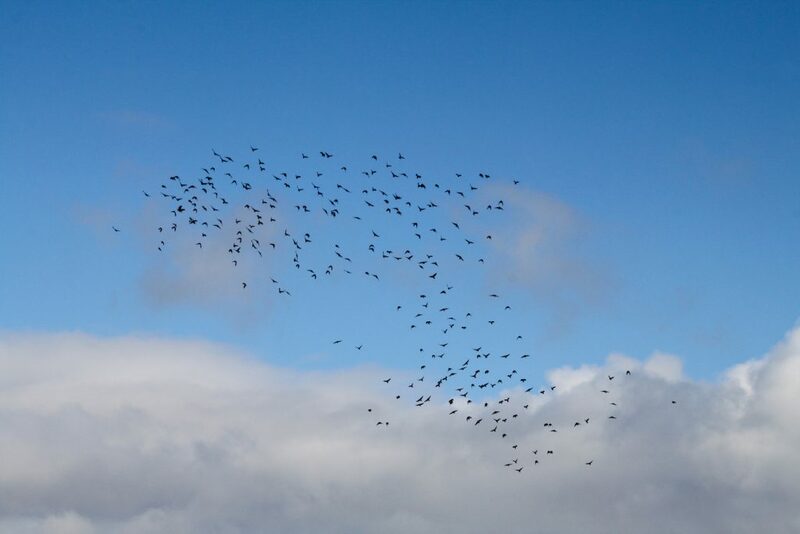 On several occasions we have seen pairs of birds circling together, probably as part of their breeding rituals. This is great news as in the 1970s these sensational raptors were driven to the brink of extinction but are now recovering well. Back on the water, swans have been puffing themselves up and displaying territorially. 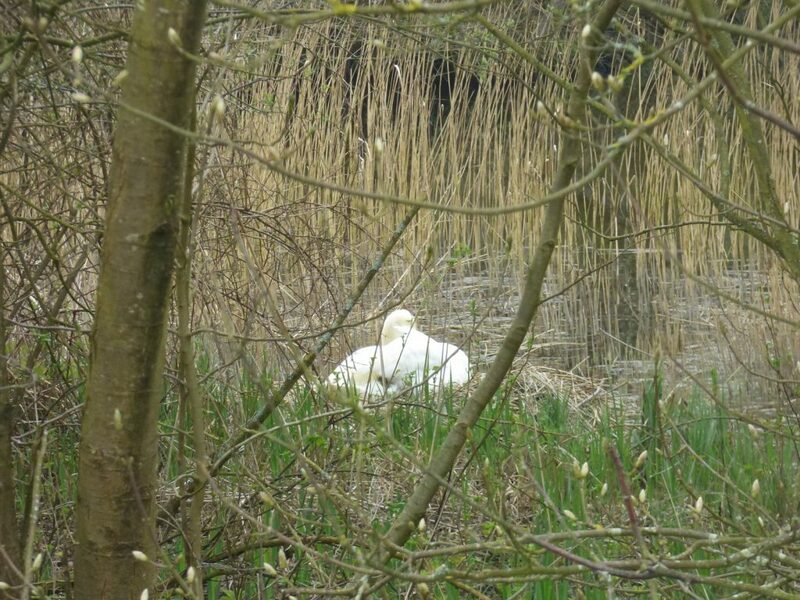 And a pair of these graceful birds appear to be alternating between two potential nesting sites in the undergrowth near Salhouse Little Broad and another small broad called the Pulk. 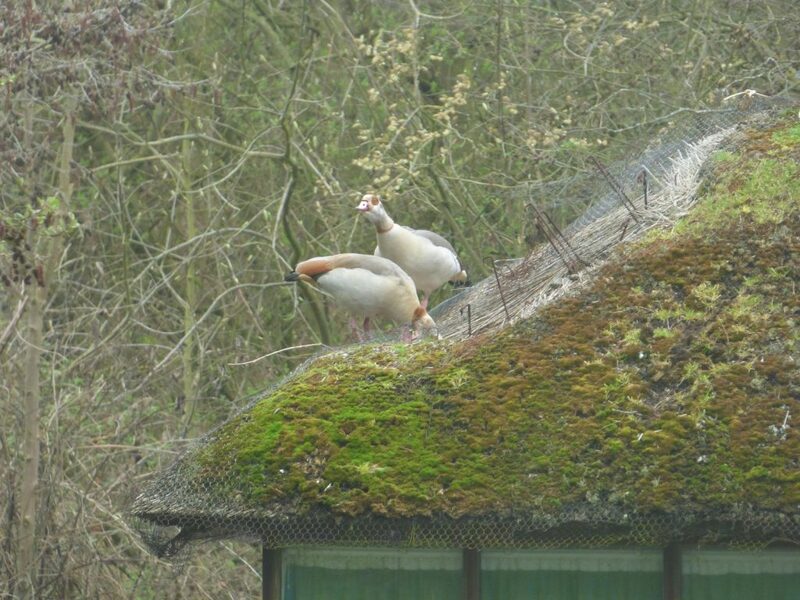 Another interesting sight is a pair of Egyptian geese that are returning to their regular nesting site on the roof of a summer house in Wroxham Village. 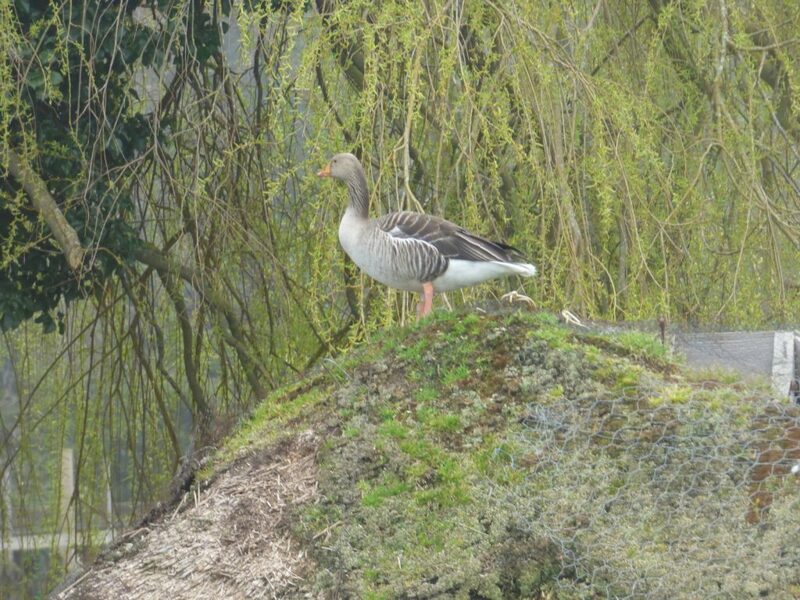 Unfortunately we saw the Egyptian geese being bullied by this larger greylag goose which pushed them off the roof of the summer house. This picture shows the bully a few seconds after it’s bad behaviour! Interestingly the reason that Egyptian geese are so much smaller than Greylags, is because they are closely related to shelducks rather than being a true goose. Our first swallows arrived about two weeks ago and more and more can be seen flying low over Wroxham Broad to catch insects. The dull weather tends to encourage insects to hatch and this has been a great opportunity for the swallows to catch plenty of food – deservedly having a good meal after their epic migration from Africa! 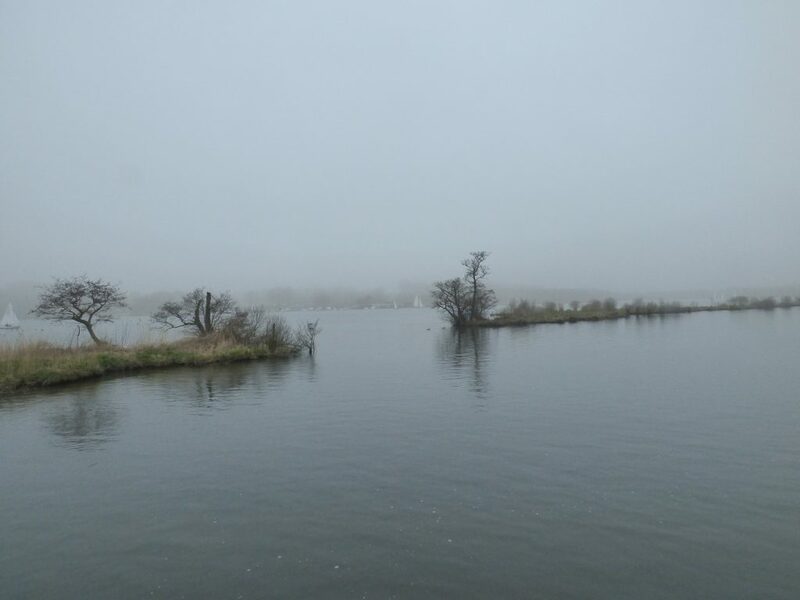 This picture shows the broad looking particularly atmospheric on a misty day last week. 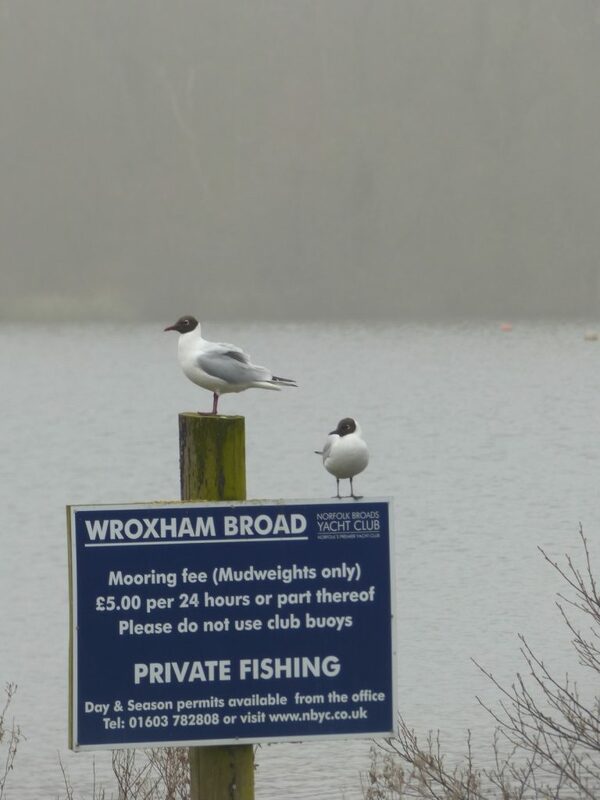 We also took this picture of two black headed gulls on the sign for Wroxham Broad. Despite their name, it is only the mature birds whose heads turn black in the breeding season before going white again in the autumn and winter. The colder weather and lack of heavy boat traffic has encouraged tufted and pochard ducks, which usually disappear after winter, to remain on Wroxham and Salhouse Broad in greater numbers than you would usually expect at this time of year. 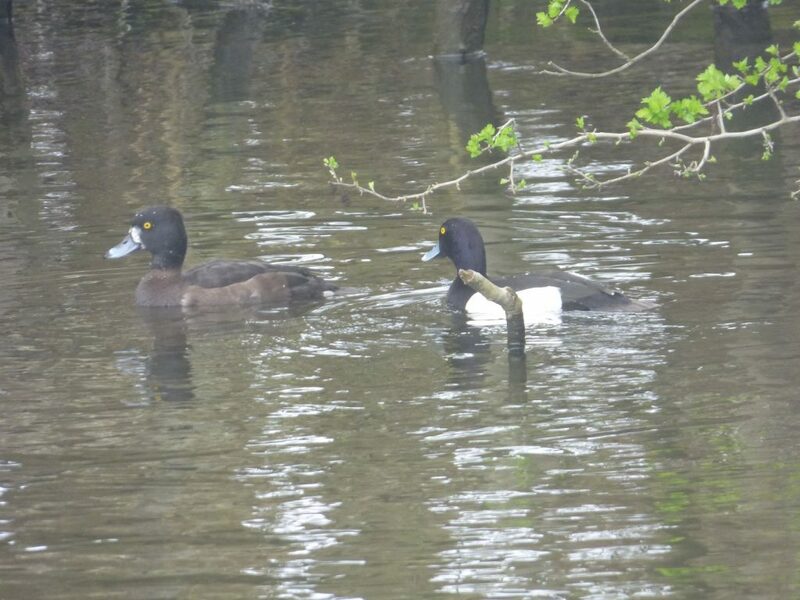 The picture below shows a pair of tufted ducks on Salhouse broad and the stark difference between the males and females. The black and white male looks stunning with a beautiful tuft on its head while the female is a drab brown and has no tufts at all! 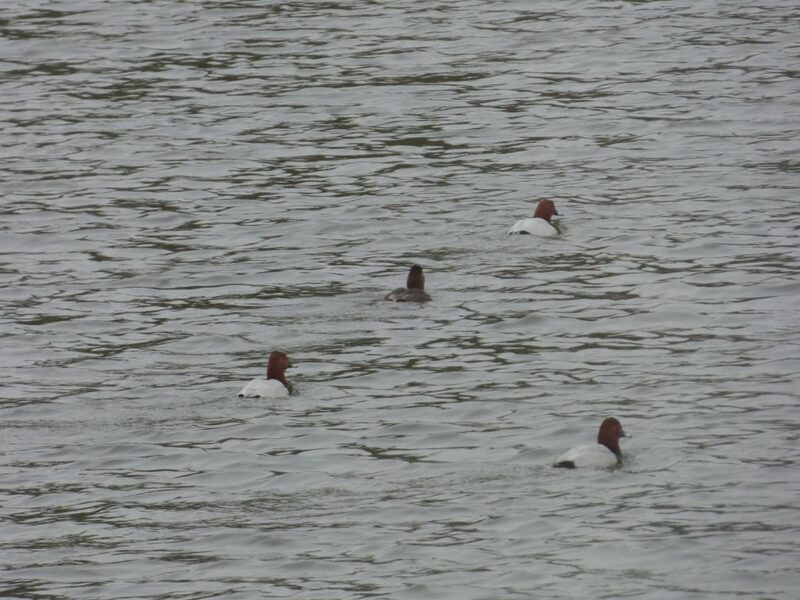 Similarly in this group of pochards pictured on Wroxham Broad you can clearly see the males with their distinctive red heads and white bodies, while the female looks drab and brown. 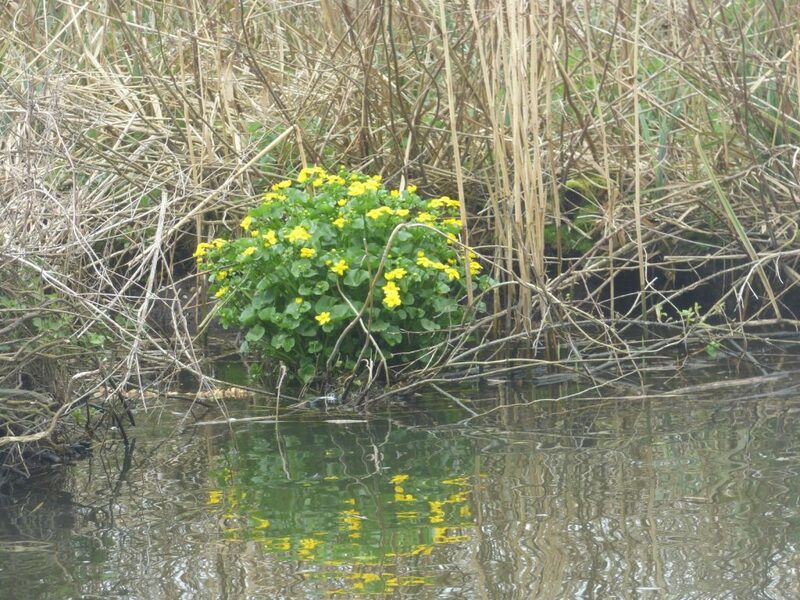 Although the bankside vegetation certainly appears to be a little behind for the time of year we currently have a splash of colour from skunk cabbage and the marsh marigolds shown below. 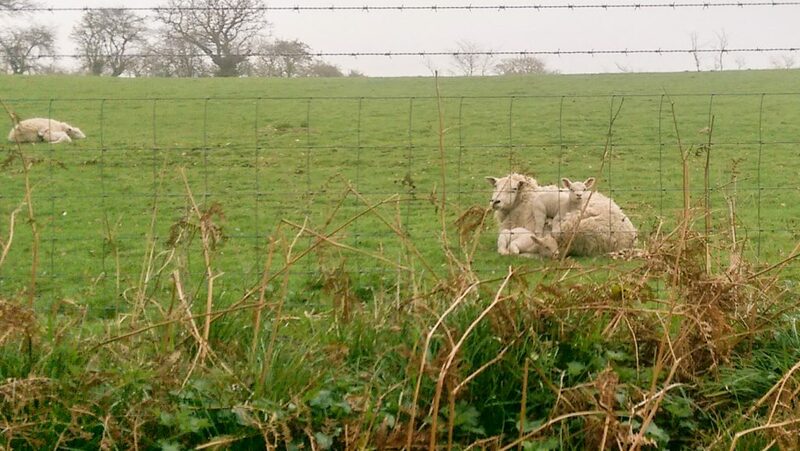 Finally, while not strictly wildlife, we will leave you with this picture of these adorable spring lambs pictured while out walking in Salhouse village! 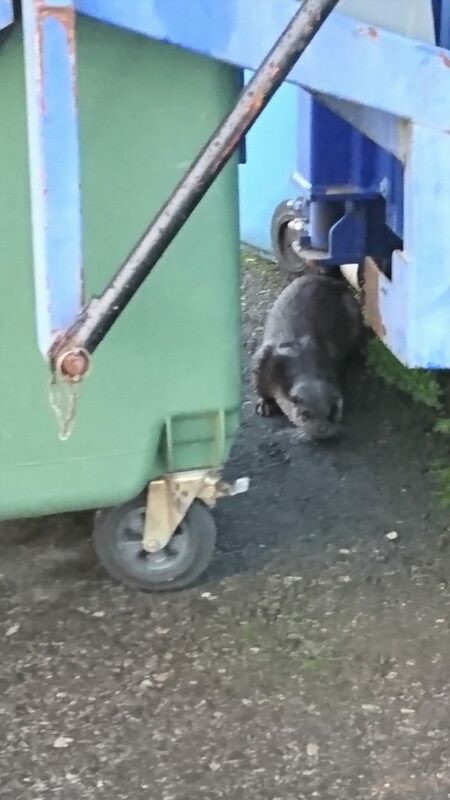 There have been more otter sightings around our boatyard than ever this winter. The enigmatic animals have been spotted everywhere from our boat basin and car park to under cars and behind recycling bins. 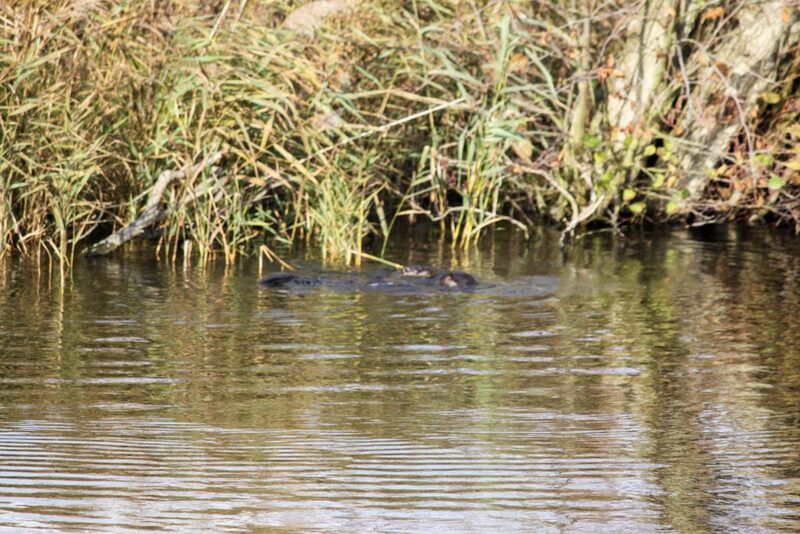 Many of the Broads Tours team have managed to take a quick snap of these surprise otter encounters and we thought that we would share some of these pictures on the blog with you. Spot an otter for a chance to win a family boat trip! With our boat trip and day boat season getting into full swing on 24 March why don’t you come down and see if you can spot an otter for yourself? We are challenging you to send us your favourite otter spotting pictures with the chance to win a boat trip for a family of four for our favourite photo. We will also share a selection of the otter spotting pictures on the blog. Email your pictures to info@broads.co.uk giving your name, address and telephone number (so we can contact the winner) plus where and when the picture was taken. Competition closes 30 June 2018. Must be taken before the 31st October 2018, for two adults and two children. Judges decision will be final. No cash alternative. Otters are perhaps the most captivating characters on the Broads. Graceful, yet enigmatic, they are the species that everyone hopes to spot on our boat trips. And the great news is that after years of persecution we are seeing more otters than ever before – having enjoyed dozens of encounters with them in 2017. 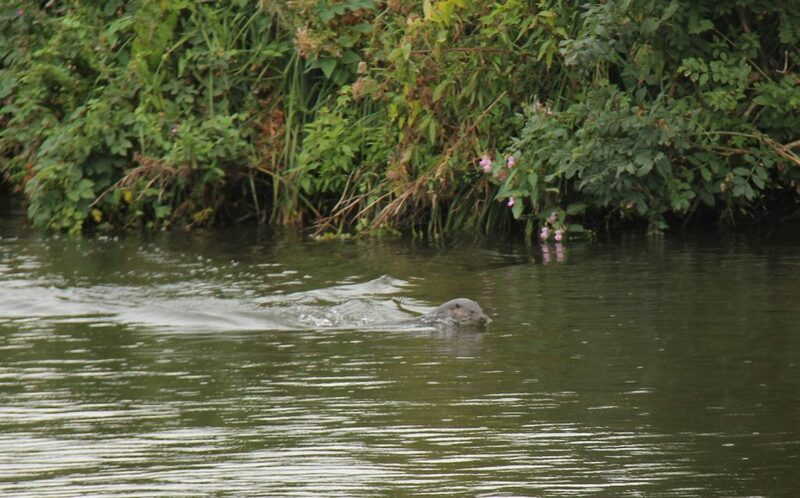 Some of our favourite sightings include watching otter families playing together in Wroxham village, being fortunate enough to have an otter swim alongside our boat for some distance as we travelled along the river Bure near Wroxham Broad and, on another occasion, following an otter right across Wroxham Broad – giving a privileged glimpse into their secretive world. Plenty of otters came to us in 2017 too by putting in surprise appearances in our boatyard. The most memorable moments include startling skipper Tom by popping up just under his small dingy as he was trying to clean windows from it, an otter entertaining passengers queuing for a boat ride by suddenly appearing next to them in the water, an otter leaving a half eaten fish on the boarding steps of the Belle of the Broads to one child’s delight (and the disgust of his mother) and even an otter running across our car park. Otters also spent the night in the warmth of our boatsheds last winter and left their tell-tell spraint on mooring ropes to mark their territory (yuk)! This is our favourite otter picture of the year taken by David Seaford, a passenger aboard the Queen of the Broads on 30 August. 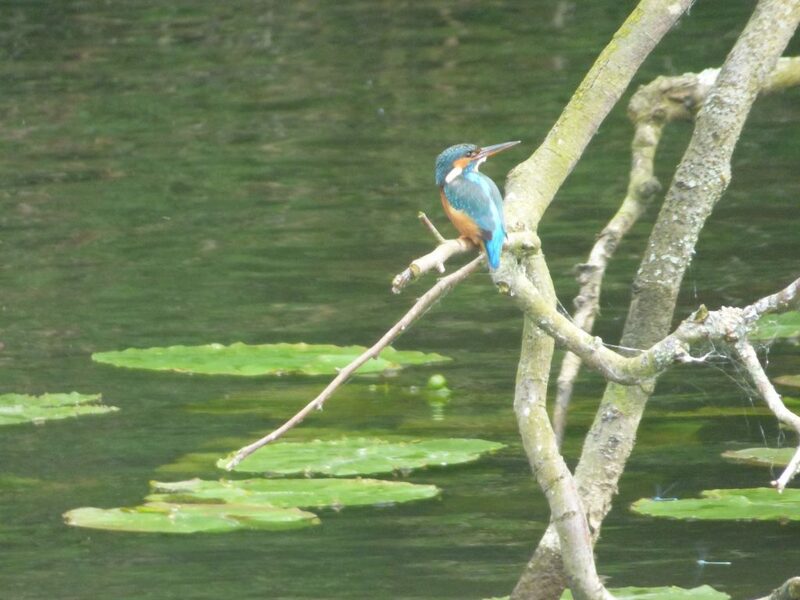 Many of our trips were given an extra spark of excitement when an eclectic blue Kingfisher suddenly flashed past. 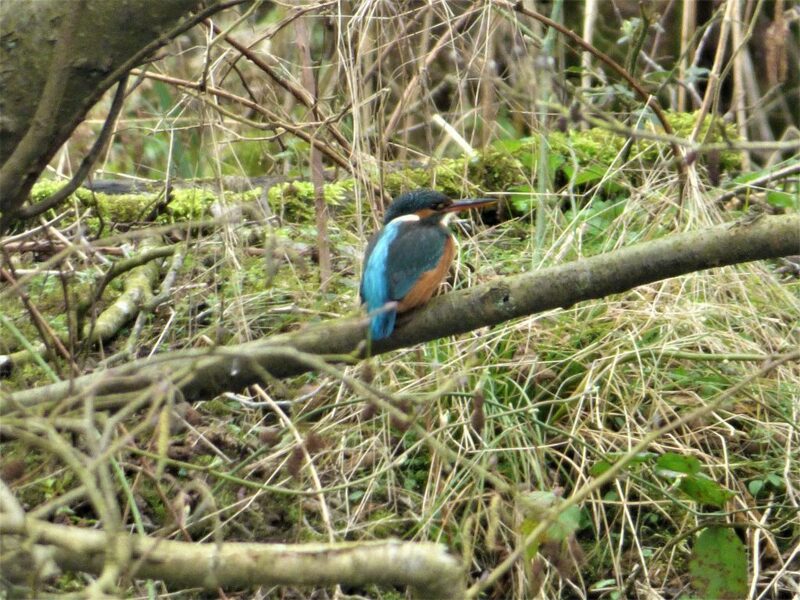 Usually the experience of seeing a Kingfisher fly fast and low over the water only lasts a second as these secretive birds usually disappear almost as suddenly as they emerge. But for a few weeks in the summer two juvenile kingfishers were far less shy and we managed to quietly bring our boat up to their favourite perch, a fallen branch near the entrance to Salhouse Broad, and watch them for some time without them flying away. It was a wonderful experience but as the birds grew up they were pushed out of this territory by their parents and are now probably just as shy as the other adults. 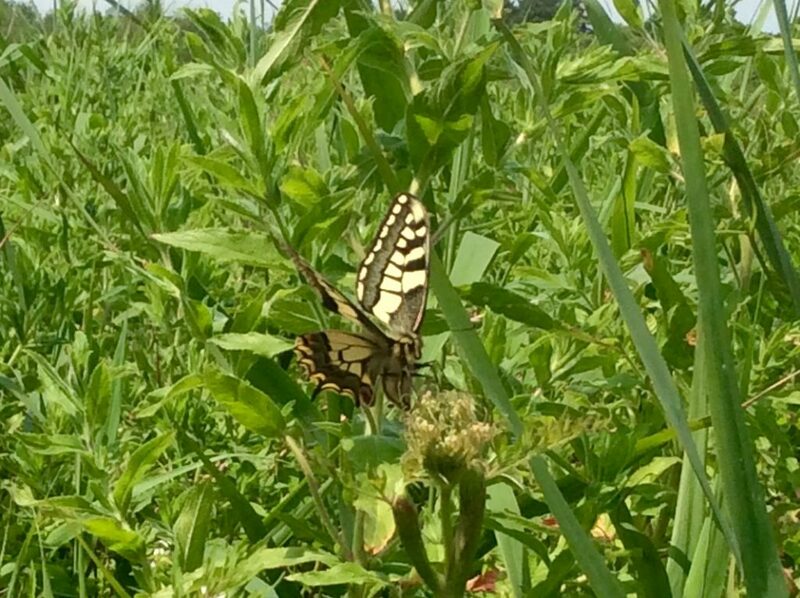 We were delighted to see Swallowtail butterflies – the stuff of Norfolk Legend – on Woodbastwick reach and while taking Ashley Primary School students around Hoveton Great Broad this summer. By far Britain’s biggest butterfly, with a swallow like forked tail, Swallowtail butterflies only live on the Broads and nowhere else in the country because their caterpillars can only eat a plant called Milk Parsley which will only grow in our National Park. Despite being such a famous jewel in Norfolk’s crown you have to be extremely lucky to see a Swallowtail because the weather conditions need to be perfect for them to emerge. That made our sightings all the more special, particularly with Ashely Primary School when a Swallowtail butterfly landed on one of the children’s brightly coloured hats! Their teaching assistant, Megan Sayer, even managed to take this sensational picture of the butterfly. We were really excited to spot a Bittern on several occasions over a period of about a week this summer both in flight and resting in the reedbeds. 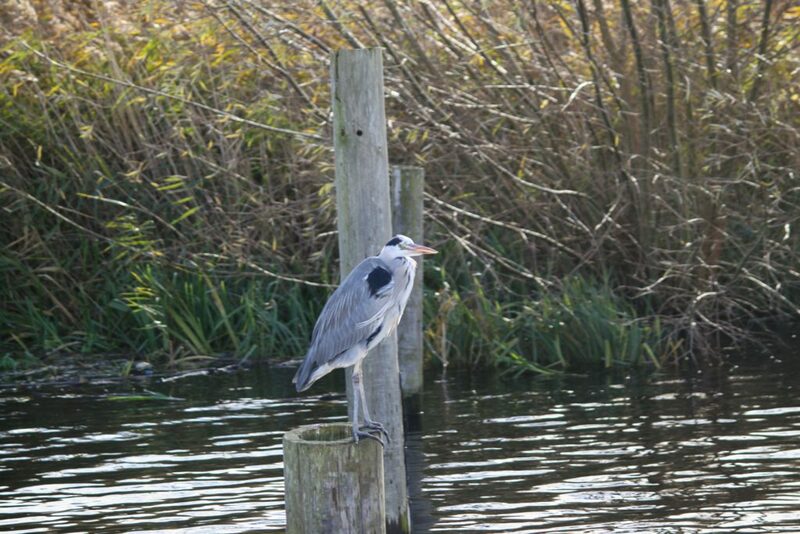 The large brown bird, which is related to a heron, is one of the most iconic creatures on the Broads, since our reed bed habitat provides a stronghold for this very rare and endangered species. Despite often being herd making their characteristic booming sound from the reed beds during the breeding season Bitterns are very rarely spotted due to their superb camouflage and retiring nature. So for us to see the Bittern on a busy section of river in the height of summer and in the middle of the day was truly remarkable. It must have been a particularly brave bird! The majestic sight of Marsh Harriers gliding past has been another highlight of 2017. The largest of the harrier family, Marsh Harriers were once almost extinct, having been reduced to their last pair in the whole of Britain in 1971. After a lot of hard work from conservationists and having been given strict protection Marsh Harriers have made a fantastic comeback on the Broads. Although they are now a regular sight, seeing these birds gracefully hunting around Wroxham and Hoveton Great Broad has been one of the great pleasures of heading out on the river this year. We have seen lots of other raptors too, including plenty of buzzards circling high on the thermals above Wroxham Broad and a Kestrel regularly perching on its favourite tree on Wroxham Island. 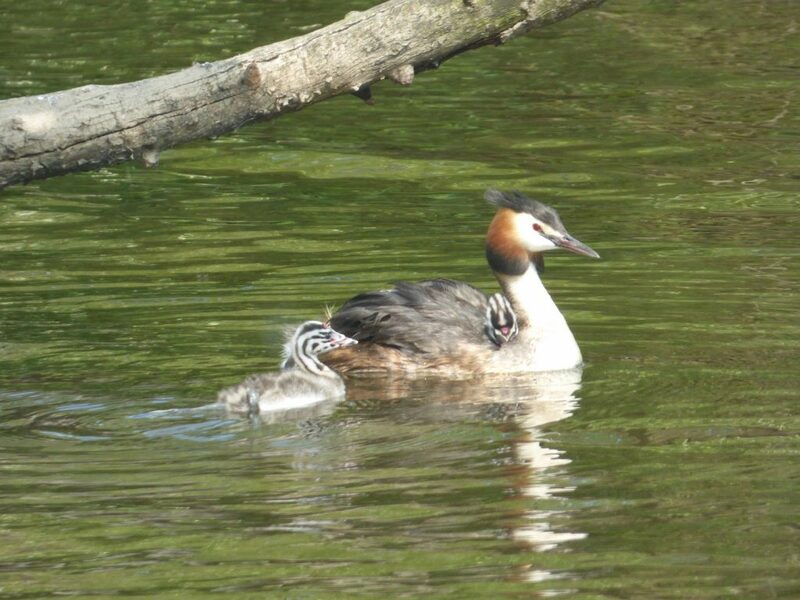 We loved watching at least five pairs of Great Crested Grebes perform their magical breeding rituals in Salhouse Broad this spring as well as elsewhere on the river. As the birds (which are related to the Penguin) have their feet right on the back of their body they can never come to land so they exhibit some really captivating behaviour. 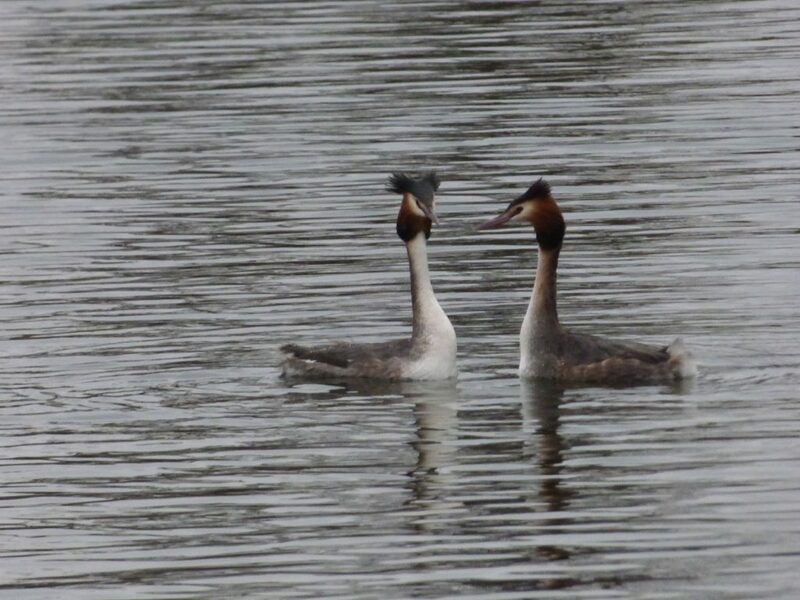 From mid February onwards we watched the Great Crested Grebe’s magical “mirror dance” in order to affirm their bonds with a mate. Watching the males and females face each other and instantaneously copy one anothers intricate movements as if looking in a mirror really was a special experience. Once the male and females paired up we spent around a month watching them build floating nests along the water’s edge to lay their eggs on. 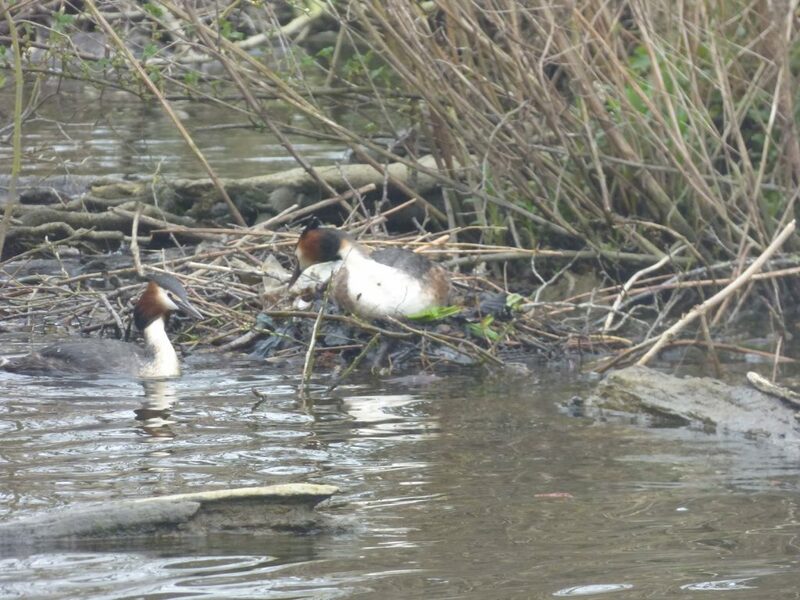 On one small area of Salhouse Broad, which we affectionately named ‘Grebe Bay’, there were four birds nesting in one small area! The nests started off small but during the month long gestation period, for which the females remained on the nest the whole time, the males worked really hard adding to the nest with everything from reeds to lilies and one even chose a gold chocolate wrapper for decoration. The males were also extra busy catching fish to feed both themselves and their partner. While the Great Crested Grebes were great to watch in the spring and summer, seeing their smaller and shyer cousins – Little Grebes – appear in late autumn and winter has been one of the highlights of the colder months. The Little Grebes hid well away from all the boat traffic during our main tourist season but when this stopped and the river became quiet again more and more Little Grebes started to emerge again. An S bend just downstream form Wroxham Broad has been a really good hotspot to watch these fluffy little diving birds that are affectionately known as ‘Dabchicks’. 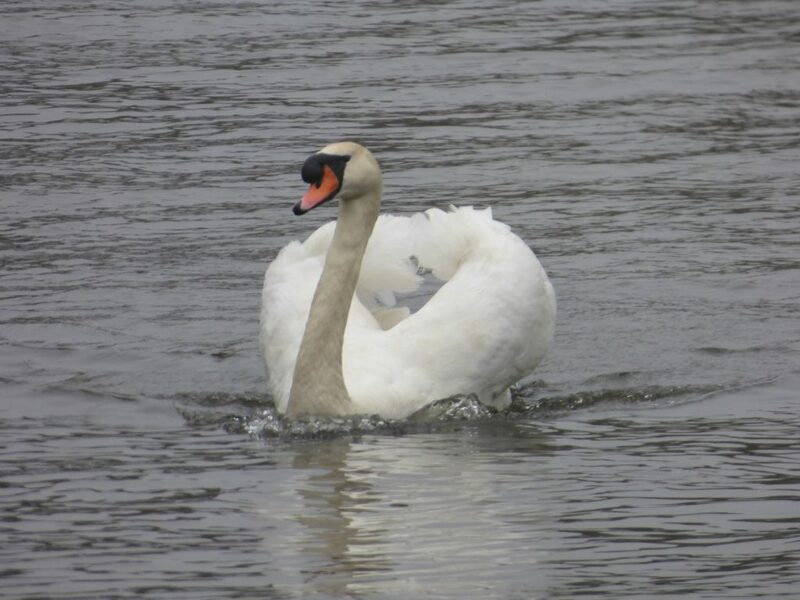 Swans are probably the most common bird you will see in Wroxham but they can still be a beautiful sight. 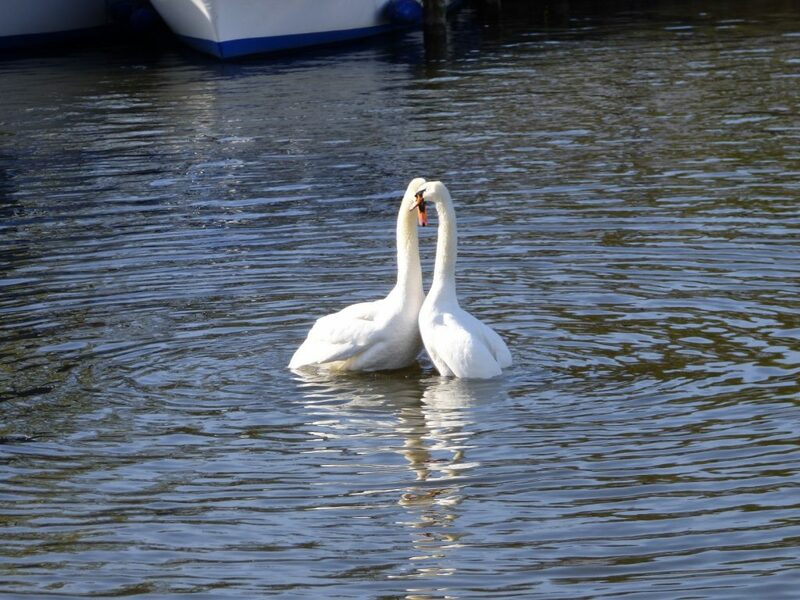 One of our favourite moments of 2017 is captured by this photo of two amorous swans preparing for the breeding season. 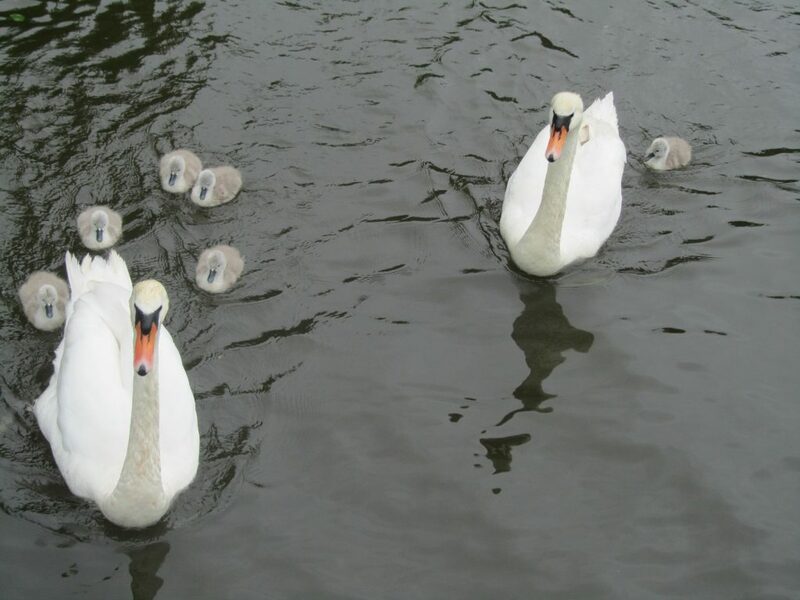 This year there were three families of swans bringing up their adorable cygnets in Wroxham village. All the cygnets did well and it was wonderful to watch them grow up through the year. 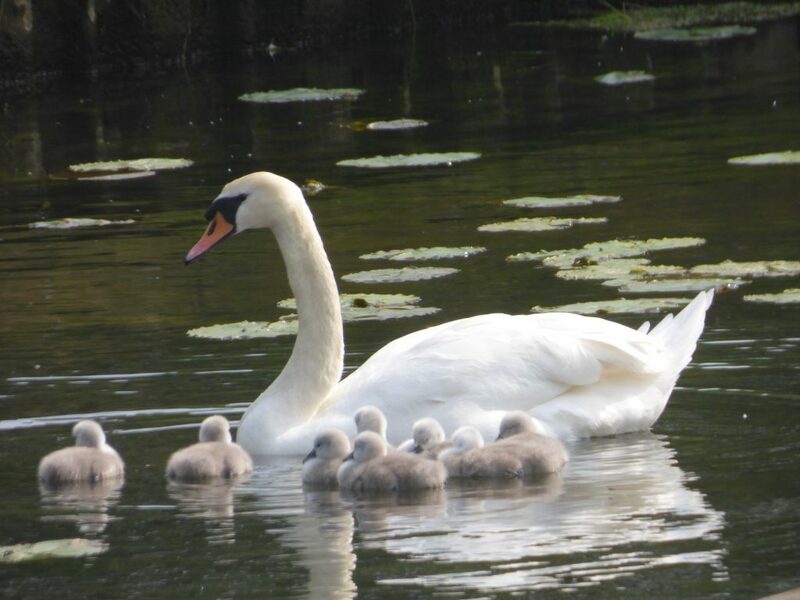 But the cutest moment has to be watching the cygnets ride on their Mum’s back! 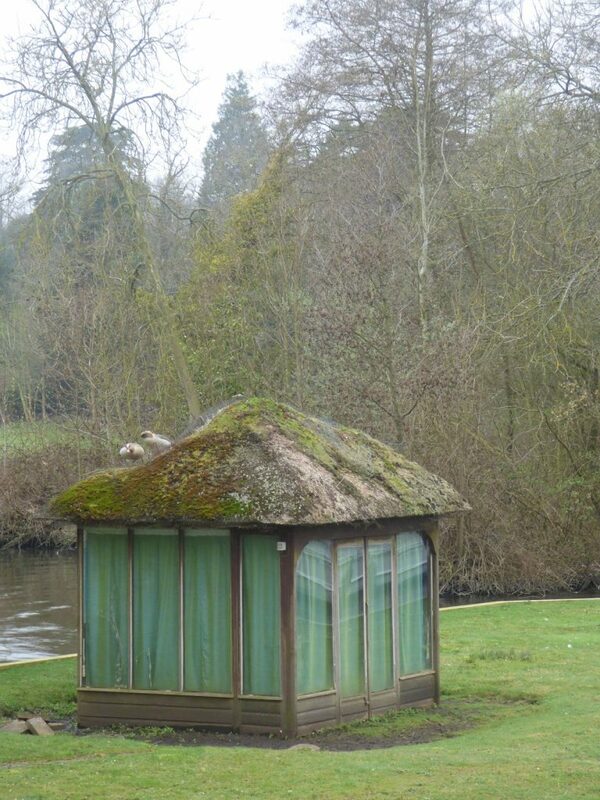 Herons might appear a bit grumpy but we’re sure they are getting cleverer. A few years ago one or two herons realized that if they tapped their beaks on the backdoor of our riverside holiday homes someone might throw them a treat. This season they seem to have taken this a step further and worked out that hanging around fisherman is less effort than catching their own fish. Throughout the year more and more herons seem to be standing patiently on the bank or even the roof of boats by anglers waiting to be thrown a fish! 10 Surprise visits from Bufflehead and Mandarin ducks. 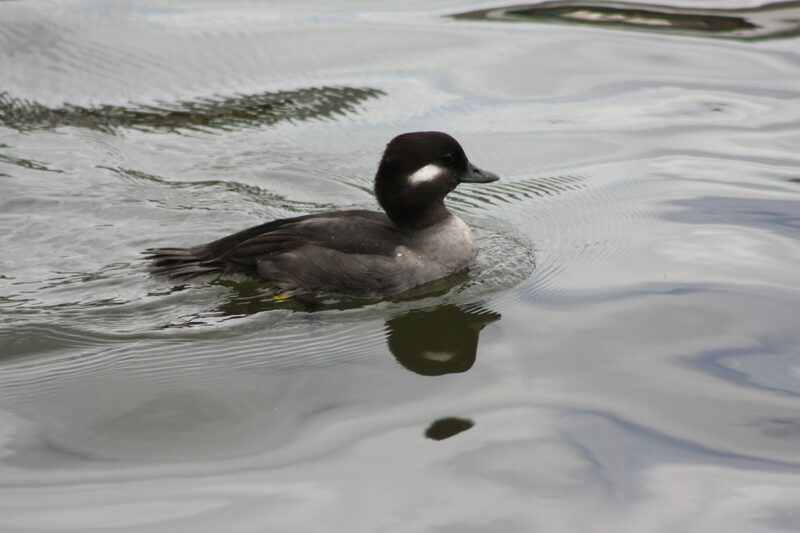 In April this female Bufflehead duck appeared for a few days in Wroxham village and caused quite a lot of excitement. After speaking to the RSPB they explained that Buffleheads usually live in Woodpecker holes in North America but this one was more likely to have escaped from a private collection! 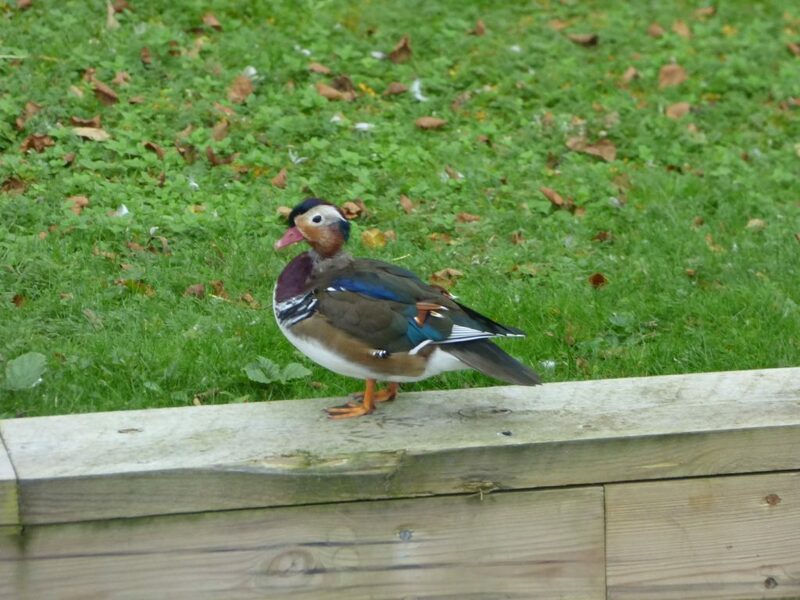 We also had two surprise visits from Mandarin ducks, with one appearing for a few days in Wroxham village in the summer and another duck showing up briefly in the autumn before seemingly vanishing. The amazingly colourful ducks were originally introduced as ornamental birds from China but the RSPB estimates that there are now 2,300 breeding pairs in southern and eastern England having originally escaped captivity. Despite these numbers the Mandarin ducks still gave us a surprise! We are really looking forward to seeing what nature brings in 2018 and hope you will join us on the water soon! 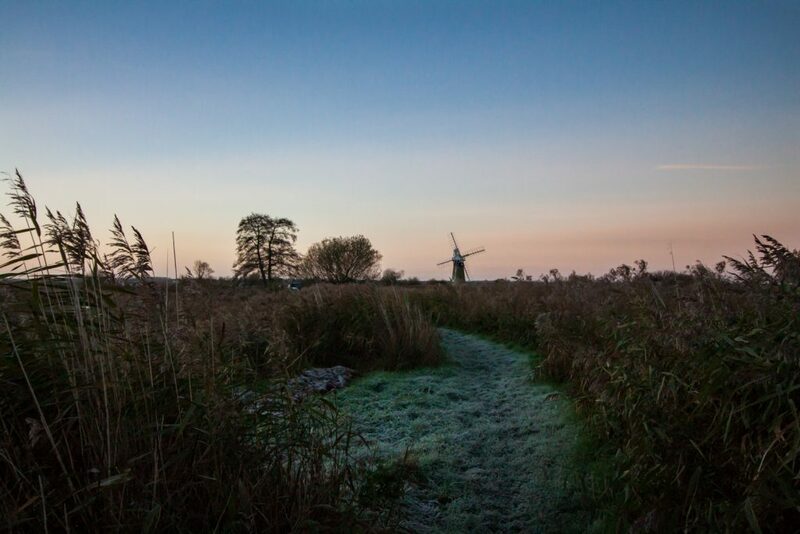 Now is one of our favourite times of year to be on the Broads, as the National Park dons its winter coat and takes on a whole new persona. Waterways that were buzzing with boats only a couple of months ago are now transformed into a wonderful winter wilderness. Not only have we been treated to some beautiful sunny days and mild weather lately but there has never been a better time to experience the Broads at its autumnal best. Our Queen of the Broads Trip boat has just had a new heating system fitted so that you can enjoy a mince pie and mulled wine trip in comfort. 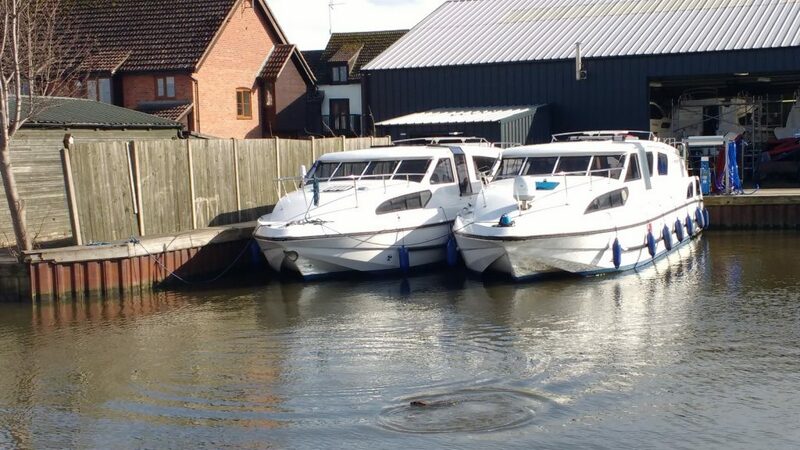 Or just wrap up warm and explore on your own with one of our day boats! 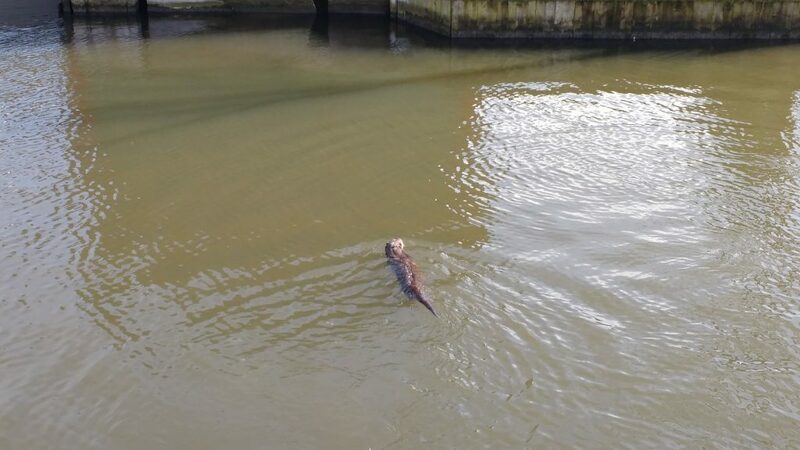 Spotting an otter is usually at the top of our passengers bucket list and now is a great time to see them as they are more likely to come out into the open when the river is quiet. James Greasley managed to capture this magical moment with two otters playing together. 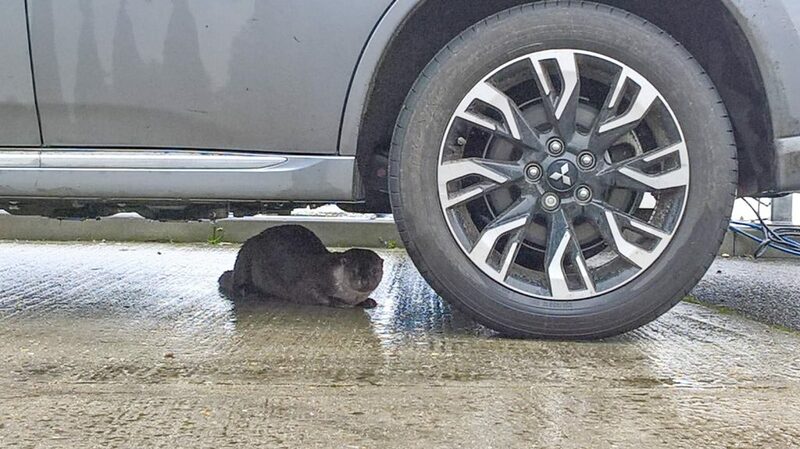 One member of staff who had more success taking a photo is our engineer Simon who took this remarkable picture of an otter running across our car park and sitting on the quay heading for a minute! 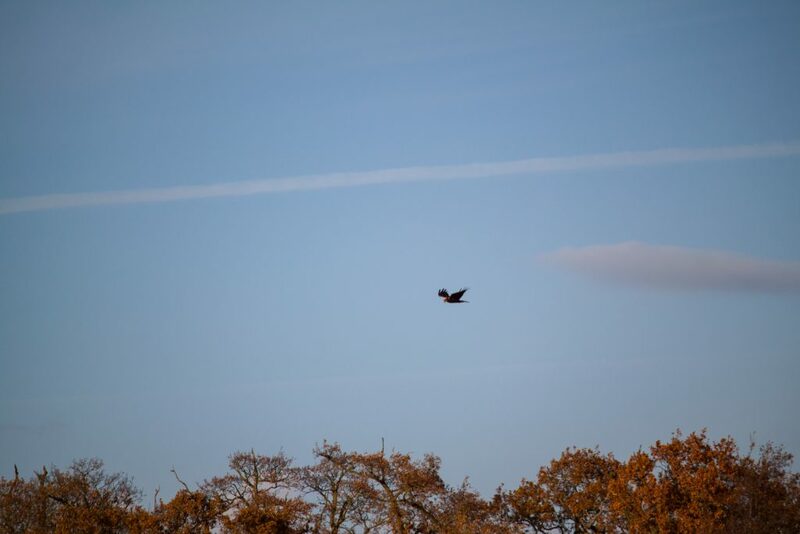 We are also seeing a good number of birds of prey on our trips, buzzards circling high on the thermals or appearing from the woodland around Wroxham Broad. A kestrel is also often perching at the top of a tree on Wroxham Island, only temporarily disturbed by our passing trip boat. “As we approach the kestrel it has tended to take off and fly over the island looking for a tasty morsel – on several occasions we have been able to watch it hovering and holding position whilst it inspects minor movements amid the vegetation,” explained Tobi. Another very much smaller species we are delighted to be spotting with increasing frequency on our boat trips is the little grebe, also known as a ‘dabchick’. 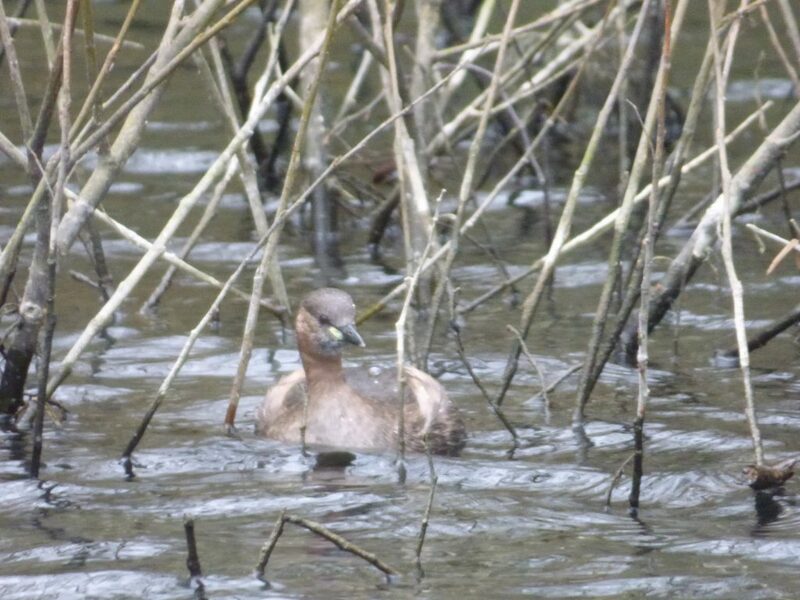 “Having had a few early spots of little grebes in the late summer, almost every trip is now yielding at least one sighting of these dumpy birds, “ explained Tobi. Although little grebes are scarce in the main season as the river gets quieter the shy little birds venture out and congregate in growing numbers. 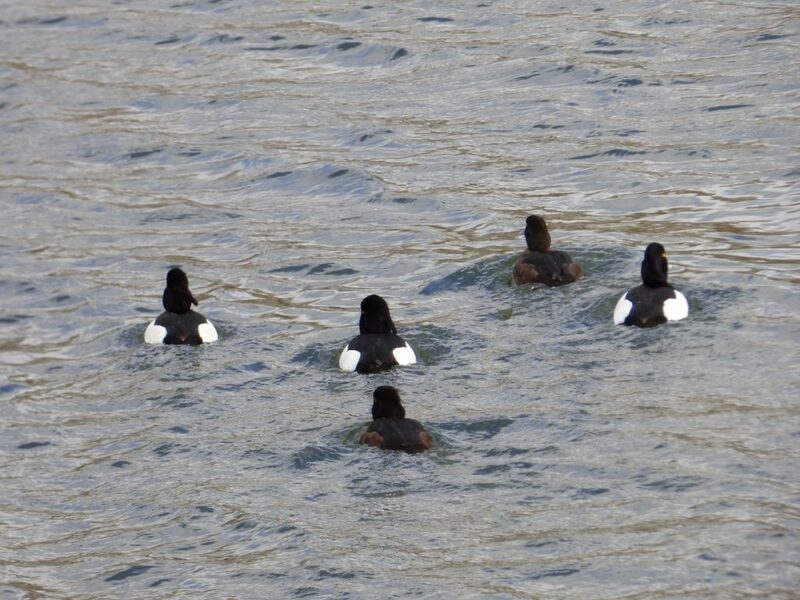 The coots and tufted ducks seem to be quite sociable and a large group of both types of bird can usually be seen ( 50-60 in total) on Wroxham Broad where they will be using up less energy in the shelter of the trees and shallow parts of the Broad. Here they will be diving down to pick up fresh water molluscs such as Zebra mussels. 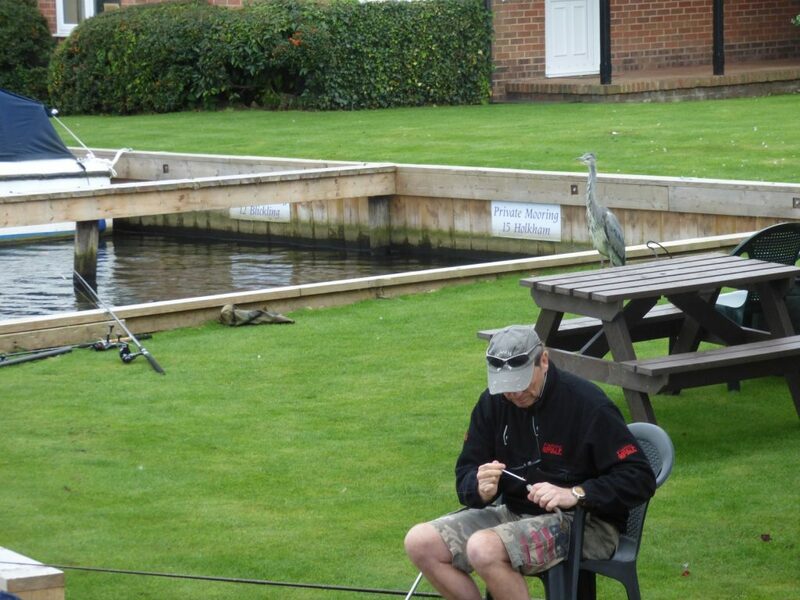 There are still plenty of grey herons to see, which continue to follow Anglers hoping for a free meal! 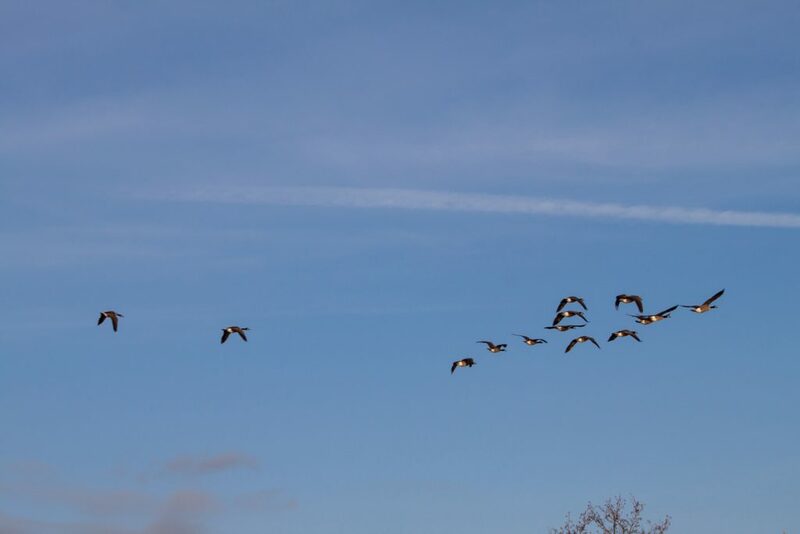 Other common sights – both pictured by James against a wonderful blue sky – include black headed gulls and Canada geese, which were almost absent in the summer but are returning to Wroxham in growing numbers. Another lovely sight was this flock of starlings, which James managed to photograph while out on the river. Finally, with the Broadland landscape reaching its autumnal best, we will leave you with some beautiful landscape pictures taken by James.